If you're caring for an aging loved one and trying to manage a job, you may have seen your own health decline, even if you've tried your best to stay on top of things. The 2011 Wellbeing of Working American Caregivers study, conducted by Gallup and sponsored by Pfizer, revealed that working family caregivers have a 25 percent higher incidence of high blood pressure. 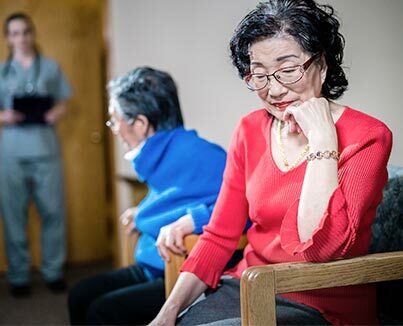 42 percent report caregiving making them depressed. Recognize the signs of stress: Are you snapping at your co-workers or others? Perhaps forgetting tasks that are normally like second nature to you? It could be stress. Identify the kinds of issues you have control over and what is best to let go. Put a plan of action into place to improve what you can and try to forget the rest. Guard yourself from depression: Depression could sneak up on you and take hold, impacting multiple areas of your life. If you're feeling overwhelmed and depressed, contact your HR (Human Resources) department or Employee Assistance Program (EAP) to find what benefits might be available to you. Many insurance policies cover counseling. Schedule an appointment with your doctor. Take a vacation . . . or at least a break: OK, so a vacation to the Bahamas may not be in the budget, the work schedule or the family caregiving plans, but find a way for a mini-vacation. Splurge by stopping at your favorite coffee shop on the way to work, rent a movie classic or take a walk around a nearby park. Just taking an hour or even a few moments to decompress could help you feel better. Learn better communication techniques: "If I had only done this," or "I wish I'd said that," is the lament of many working family caregivers. Effective communication can help you get what you need to stay healthy. If you need help, don't be afraid to ask for it. It's important to be proactive in communicating your challenges and needs. Sleep, diet and exercise: If there were a magic potion for family caregivers, this could be it. Eating healthy, walking as much as you can (at least 30 minutes a day is recommended) and getting seven to eight hours of sleep may seem like an impossible goal, but it could make the difference between maintaining health and a downward spiral. Think about ways you could incorporate these potentially life-saving healthy habits. Don't go it alone: Your EAP could be a great source of information on whether your company offers counseling, resource and referral services, support groups and other help. In addition, more companies have wellness programs. Find out if yours does. If not, try to connect with a group in your community (contact your local Area Agency on Aging) or in your faith community. Even scheduling coffee once a week with a friend could bolster your attitude and help you feel as though you're not alone. It's easier said than done, but try not to allow caregiving to consume your life.